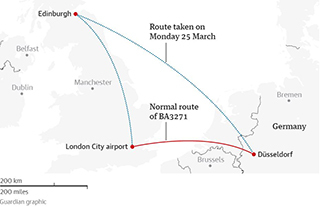 BA flight lands in Edinburgh instead of Düsseldorf by mistake. Photo: The Guardian. Before I tell you about a Düsseldorf-bound flight that landed in Edinburgh by mistake, allow me to share my own tale of misdirection. In 2005, young teenybopper me boarded a flight to Fort Lauderdale to visit a good friend over the winter holidays. As soon as I got comfortable in my seat, in went the earbuds blasting some sort of dime-a-dozen pop music. The takeoff and flight went smoothly until I realized that we started landing only 90 minutes into the flight and, concerned, I unplugged the earphones to hear that the plane has started its descent into New York. Somehow, I had boarded the wrong plane -- despite my boarding pass being checked at the gate -- sat in my assigned seat -- which was empty -- and flew to New York instead of Fort Lauderdale. True story. So I completely sympathize with a British Airways flight that was destined for Düsseldorf, but landed in Edinburgh. Instead of heading east from London, the plane flew north – 500 miles in the wrong direction -- and the mistake was only spotted at landing when the flight was welcomed to Scottish capital. Passengers thought the pilot was joking when he announced, “welcome to Edinburgh” over the PA system. “The pilot said he had no idea how it had happened. He said it had never happened before and that the crew was trying to work out what we could do,” Sophie Cooke, a 24-year-old management consultant who travels from London to Düsseldorf weekly, told the BBC. One eyewitness said the pilot took a show of hands from passengers to see who wanted to go to Düsseldorf. They all did. Shocker. 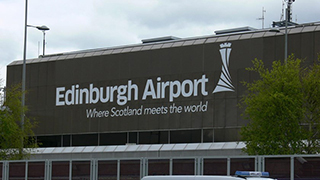 The plane spent two and a half hours on the tarmac at Edinburgh airport to refuel before it could take flight towards its intended destination, a stuffy wait with blocked toilets and no snacks. BA said the BA CityFlyer-branded flight was run by WDL Aviation, a German operator, under a “wet-lease” arrangement, so WDL operated the service with its own crew and captain and they filed the flight plan for Edinburgh incorrectly. Both BA and WDL have launched an investigation as to how such a botched flight schedule could occur. Along with a bonus trip to Edinburgh, passengers should be receiving at least €250 (CAD$377) in compensation under EU flight delay regulations for landing five hours and 20 minutes behind schedule -- on a flight that normally only takes one hour.